Anapra, one of the poorest neighbourhoods in Mexico’s Juarez, lies twenty metres outside America. Faustino wants to escape from the gang he's working for. Having dipped into dollars he was supposed to be hiding, he's on the run. He and his friend, Arturo, have 36 hours to replace the missing money, or they're as good as dead. 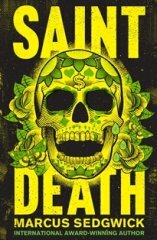 Watching over them is Saint Death. Marcus Sedgwick is a full time author. His first novel, FLOODLAND, won the BRANFORD BOASE AWARD for Best Debut Children's Novel of 2000. Since then his books have been shortlisted for the GUARDIAN CHILDREN'S FICTION PRIZE, the COSTA BOOK AWARD and many more. Visit his website www.marcussedgwick.com and Twitter @marcussedgwick.